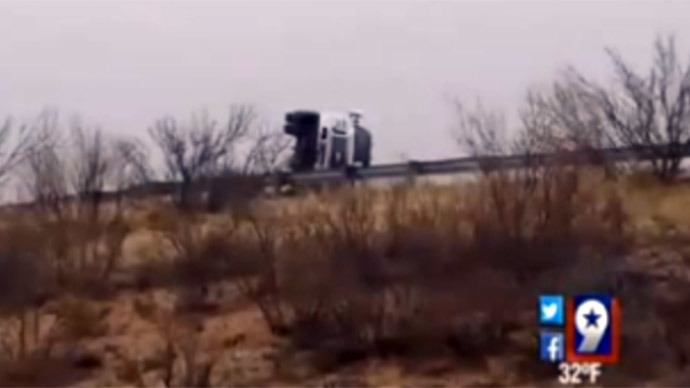 Ector County Sheriff Mark Donaldson told the Associated Press that the prison bus was traveling across an icy overpass 16 miles west of Odessa, Texas early Wednesday when the vehicle slide off the road and landed on nearby railroad tracks where it collided with a train. The bus was carrying 12 prisoners and three corrections officers at the time of the accident, a Department of Justice spokesperson told the AP, and all 15 passengers had been confirmed as either dead or injured. According to a statement provided by the Texas Department of Criminal Justice, eight prisoners and two corrections officers were killed. "It's with a heavy heart that we mourn the loss of those killed and injured this morning in a tragic accident," said Brad Livingston, executive director of the Texas Department of Criminal Justice. "Their loved ones will be in our thoughts and prayers." "It's as bad as you can imagine," Kavin Tinney, a battalion chief, added to The Odessa American newspaper. "In 32, years it's as bad as anything I've ever seen." According to the Justice Department, the bus was carrying inmates from the Middleton prison in Abilene to the Sanchez prison in El Paso, a distance of roughly 450 miles, and was just past the halfway point when the accident occurred near Odessa.